What makes the Ransom32 RaaS so scary is that Javscript and HTML are cross-platform and run equally as well on Macs and Linux as they do in Windows. This means that with some minor tweaks, the Ransom32 developers could easily make NW.js packages for Linux and Mac computer. Though there does not seem to be any indication that this is being done as of yet, doing so would be trivial. It is inevitable that ransomware will be created for operating systems other than Windows Using a platform like NW.js just brings us one steps closer. Ransom32 was first reported by infected users Fabian Wosar of Emsisoft and Security Researcher xXToffeeXx searched for a sample they stumbled upon the Ransom32 TOR affiliate service. It is very easy for an affiliate to join this RaaS as all that is needed is a bitcoin address that the affiliate's share of the ransom payment will be sent to. Once a bitcoin address is submitted, an affiliate will be shown an Affiliate Console where they can see the statistics for their personal distribution campaign and configure various settings on how the ransomware should be executed. This affiliate console will contain statistics that include the number of people that successfully installed the client, the number of people that were shown the lock screen when the encryption was completed, the number of bitcoin transactions to your address, and the amount of ransom payments sent to your payout address. In the console an affiliate will also be able to configure various settings for how the Ransom32 executable should run. BTC amount to ask: BTC amount to ask. Don't be too greedy or people will not pay. Fully lock the computer: By default the lockscreen will popup each X seconds after being minimized. You can configure it so the user will not be able to minimize the lock screen. The downside is that will be more difficult for the users to check that their files were truly encrypted and also they will need to find another method to send your Bitcoins as the browser will be blocked too. Low CPU Usage: Will encrypt files at 0-25% speed while the lock window is not shown, so the process won't be noticeable in the task manager by an advanced user because of high CPU consumption. Show the lockscreen before encrypting: By default the client will show the lockscreen after encrypting part of the files in the computer (filesize under 50 Mb) and continue encrypting in the background. You can tell it to show the lockscreen right after installing, before encrypting any file in the background. The downside is that if the user tries to check his files just when the window pops in, he will notice that any file has been encrypted (although it is encrypting while is running). Show a message Box: This box will be shown before installing and before any latent timeout is applied. Latent Timeout: The client will "wake up", connect to the server and start encrypting after this amount of seconds passed after installing. The client won't connect to the server until it wakes up (more stealth), so you won't notice an install in your stats until this moment. NOTE: The client will not save the latent info as-is. Will be mixed with some data so is not understandable at first sight. Because of this, expect a 0-4 minutes drift to your timeout. 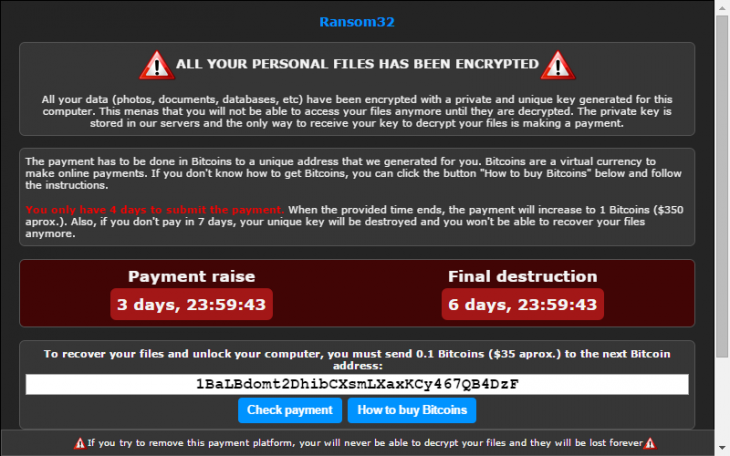 Once an affiliate has configured the ransomware to their liking, they simply need to click on the download button to generate and download their customized copy of Ransom32. 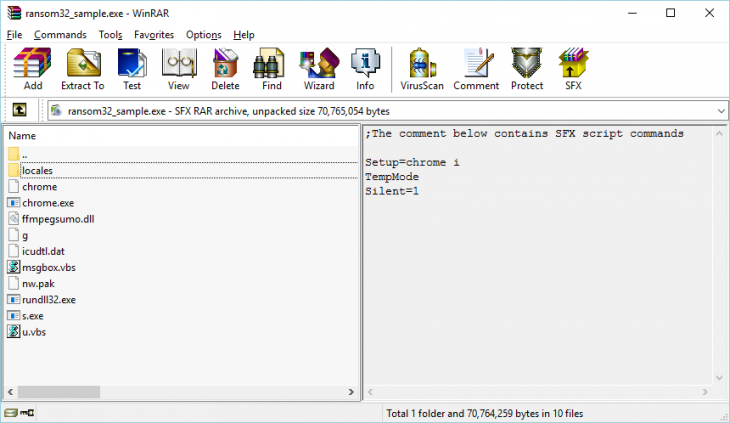 This download is a self-extracting RAR file that weighs in at 22MB and when extracted totals over 67MB. Once the customized ransomware is downloaded, it is up to the affiliate to determine how it should be distributed. An important feature for any "commerce" campaign is to be able to track its performance. As only a bitcoin address is required to join the affiliate program, it is very easy for an affiliate to track each distribution method's performance by simply using a different address for each campaign. chrome - The Chromium license agreement. chrome.exe - This is the main executable for the malware and is a packaged NW.js application bundled with Chromium. ffmpegsumo.dll - HTML5 video decoder DLL that is bundled with Chromium. g - The settings file that contains various information used by the malware. This information includes the affiliate's ransom amount, bitcoin address that they receive payments on, and error message that is shown in a messagebox if the Show a message Box setting was enabled. locales - Folder containing various language packs used by Chrome. msgbox.vbs - The messagebox displayed if the affiliate enabled the Show a message Box setting. nw.pak - Required for the NW.JS platform. 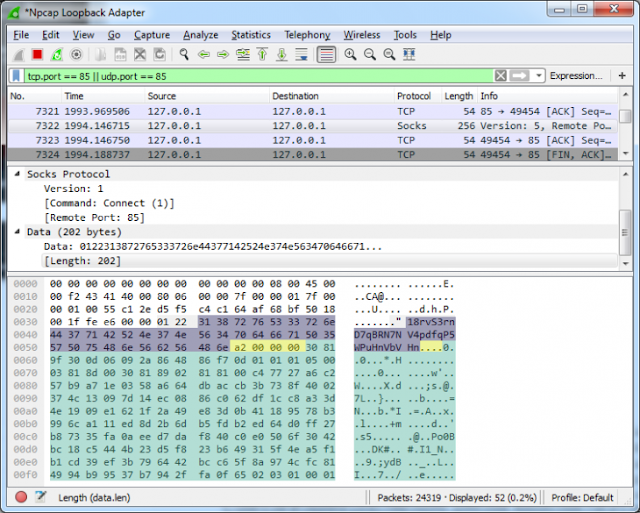 rundll32.exe - Renamed TOR executable so that the malware can communicate with the TOR Command and Control server. s.exe - Renamed Shortcut.exe from OptimumX. This is a legitimate program used by the malware to create the ChromeService shortcut in the Startup folder. u.vbs - A VBS script that deletes a specified folder and its contents. At glance it looks suspiciously like a copy of the famous browser "Chrome". The forgery is revealed only in that it does not have a digital signature and version information is missing. Further analysis they expose as a packed NW.js application. When it has finished encrypting your data it will display the Ransom32 ransom lock screen/ransom note as shown below. 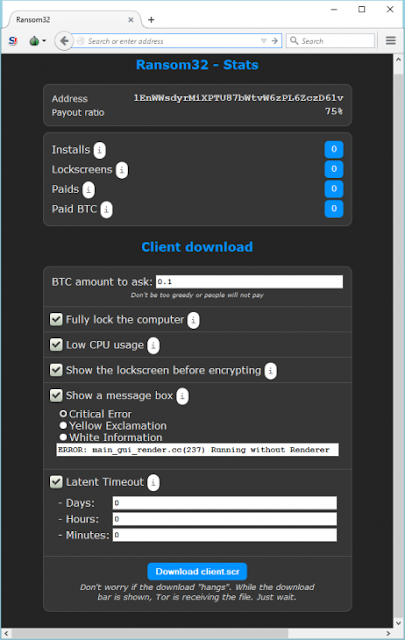 The Ransom32 lock screen will display information that tells the victim what has happened to their files, how to pay the ransom, the ransom amount, and the bitcoin address a ransom payment is sent to. The language used by the lock screen is shown in either English or Spanish, with the default appearing to be English. Last, but not least, this screen allows you to decrypt one file for free to prove that it can be done. Encryption is performed under the AES (Advanced Encryption Standard) 128-bit key with the CTR mode. For each file, a new key is created. This in turn with the RSA algorithm and a public key encrypted, which was retrieved in the first communication with the C2 server. Extract from the individual protocol exchange between Ransom32 and the C2 server to Bitcoin address (violet) and retrieve public keys (length in yellow, key in green). The encrypted AES key is used together with the AES-encrypted data in the - saved file - now also encrypted. The malware also offers to decrypt a single file again to prove the victim that the malware developer encryption can actually pick up again. For this purpose it sends the encrypted AES key of the selected file to the C2 server, which then sends back the decrypted AES key for the file. Unfortunately, at this time there is no known way to decrypt the files for free, but if anything changes we will post about it here.